Apilla is an heirloom variety originally from Cochabamba, Bolivia. 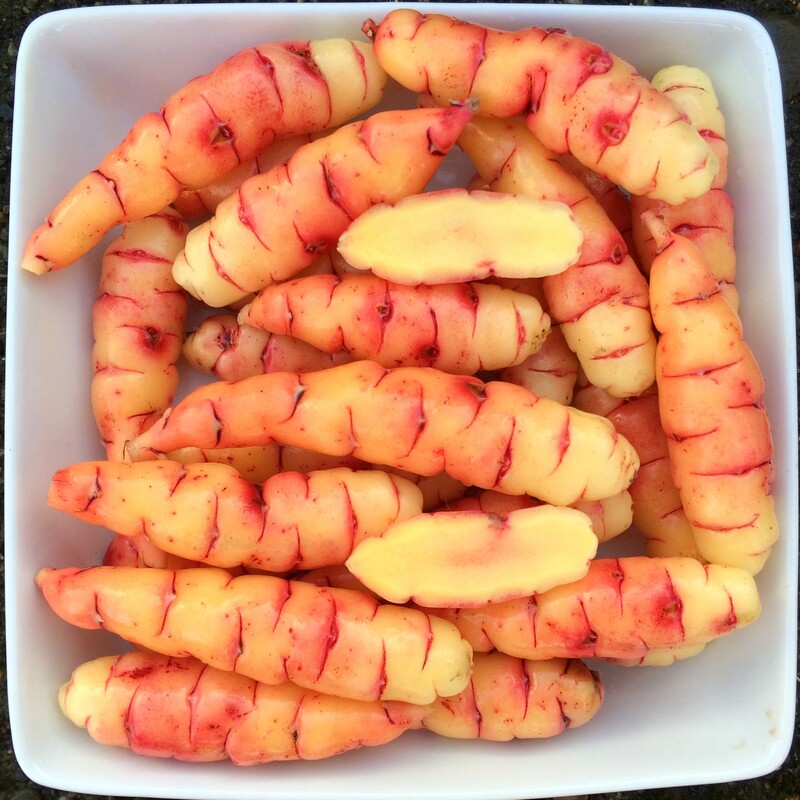 The name is somewhat redundant name as it is simply the Aymara word for oca, but I generally don’t rename varieties unless there are duplicates, since that gets confusing quickly. Apilla is a slightly tart variety with a soft consistency when cooked. It will substitute easily into potato recipes. It isn’t tart enough to be particularly appealing for eating raw. Like most varieties, Apilla loses most of its color when cooked, becoming light yellow inside and out. Apilla plants are moderate in height and remain relatively compact at maturity. Tubers are produced on stolons of intermediate length, which prevents crowding, resulting in regular shapes. Tuberization photoperiod is about 12.5 hours, a week earlier than most heirloom varieties. Average yield is 1.6 pounds. The maximum tuber length is 5.0 inches and the average tuber length is 2.1 inches. Average tuber count is 35. There are about twice as many small tubers as large with this variety. This variety has relatively low tuber dormancy and is among the first varieties to begin sprouting, usually in February here. Apilla is a moderate flowerer with a mid-styled flower, flowering here in August and September.